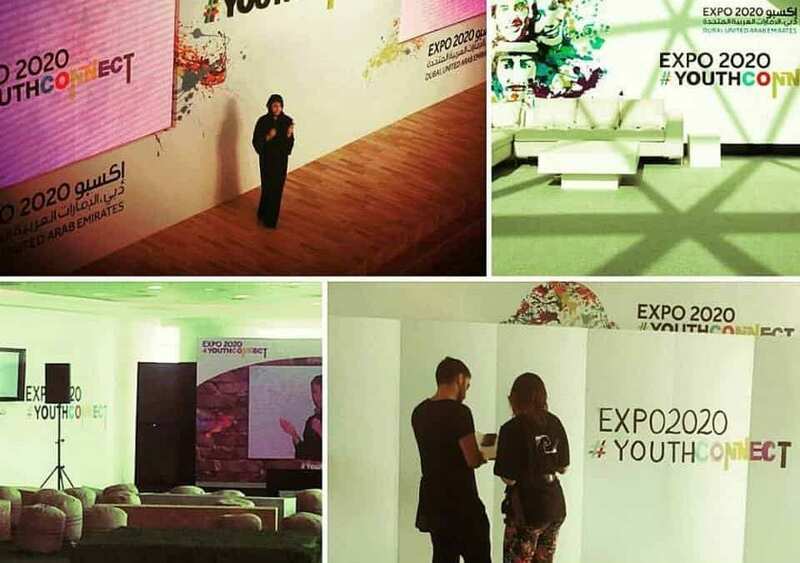 The first in a series of annual events designed by youth for youth to unlock opportunities Dubai, UAE. The event is the first in a long-standing and wide-ranging series of interactive forums, designed by youth for youth. YouthConnect gathers UAE residents between the ages of 16 and 25 for an immersive experience, engaging them through inspirational speeches, hands-on workshops and engaging discussions led by some of the world’s most successful individuals from a variety of industries and disciplines. Participants were encouraged to tailor their individual journeys for the event, creating both an educational and entertaining day that catered to their interests. Opening the event with a heartfelt keynote speech, Her Excellency Reem Al Hashimy, UAE Minister of State and Director General of the Bureau Dubai Expo 2020 said “We are designing Expo 2020 Dubai and its proclaimed theme: Connecting Minds, Creating the Future with this next generation of leaders and innovators in mind.” Her Excellency added “The fact that you have made the choice to be in this room means that you are already watching out and planning for that future. Ready to grasp the right opportunities and make those vital connections … For us that is a sign of your strength and potential. For you it is another step on the road to success.”By introducing the elements of partnership and collaboration, network-building, science in action, creative design, skills development, career coaching and cultural exchange, YouthConnect started unfolding the Expo theme, which ultimately will help develop the nation’s burgeoning knowledge economy and position as a catalyst for economic, cultural and scientific innovation around the world. The core objective of the event is to inspire the youth in attendance with the confidence to take ownership of their future; this is by demonstrating the possibilities of what can be achieved, by providing tangible skills that will empower them to take a leading role in the journey to 2020 and beyond. The venue was designed to ensure maximum engagement, with dedicated areas to encourage a self-service approach to participation. On arrival, participants entered into the “Let’s Explore” zone; a dynamic and inviting set of exhibitions with activation areas and innovative stands delivered by event partners. From here, the “Let’s Empower” space featured hand-on workshops including ‘Everyone can be a leader’, delivered by artic explorer and philanthropist Adrian Hayes, a ‘Sumobot’ robotics competition with New York University Abu Dhabi, two exciting activities with the Mohammed Bin Rashid Space Centre (MBRSC), a ‘Calligraffitti’ workshop with artist eL Seed and Taskheel, a photography skills workshop with the Hamdan Bin Mohammed Bin Rashid Al Maktoum International Photography Award (HIPA) and a session focusing on entrepreneurship and start-up skills with Google and Astrolabs where attendees got the opportunity to design and get guidance on creating their own business plan to enable their dreams. Running simultaneously, the “Let’s Talk” space offered a more relaxed and intimate setting for dedicated speakers to share their personal stories and tips on boosting employability and achieving success. In these discussion corners, participants were able to interact freely with young Emirati inventor Adeeb Al Blooshi; Mohammed Saeed Harib, founder of renowned animated TV series Freej; Zayan Ghandour, co-founder of s*uce fashion boutique; footballer and humanitarian Frederic Kanoute; Amal Al Marri and Deem Albassam, the co-founders of SALT food truck, as well as senior representatives from Facebook; and LinkedIn. Other participants elected to start their day by listening to high-achieving individuals as they shared their personal accomplishments in the “Let’s Inspire” area. Speakers included Jon Duschinsky Co-Founder and CEO of The Conversation Farm, contributor to the idea of the Ice Bucket Challenge, author and one of the world’s leading social innovators and entrepreneurs and Sarah Amiri, Science Lead on the Emirates Mars Mission. Each session concluded with an informal Q&A, with participants encouraged to ask more in-depth questions. A break for lunch also included an opportunity for participants to access the “Let’s Network” space, a hub for exchanging ideas with their peers while sampling gastronomic offerings and distinct beverages from the innovative café Tom & Serg. Before heading back to their selected activities for the afternoon, participants were also able to enjoy exclusive performances by “Imagine”, a unique show that combines comedy and illusion, performed by Kuwaiti comedian Abdulateef Al-Saleh and award-winning illusionist, Abdulwahab Al-Failakawi.